Vector-R is a partially reusable Microsatellite Launch Vehicle developed and operated by Vector Space Systems as part of a family of small launch vehicles consisting of the Vector-R (Rapide) and Vector-H (Heavy). The Vector-R has been conceptualized for cost-effect access to space at a high launch cadence of 100 missions per year while the Vector-H variant comes in for higher-performance missions with a lift capability of 100 Kilograms. 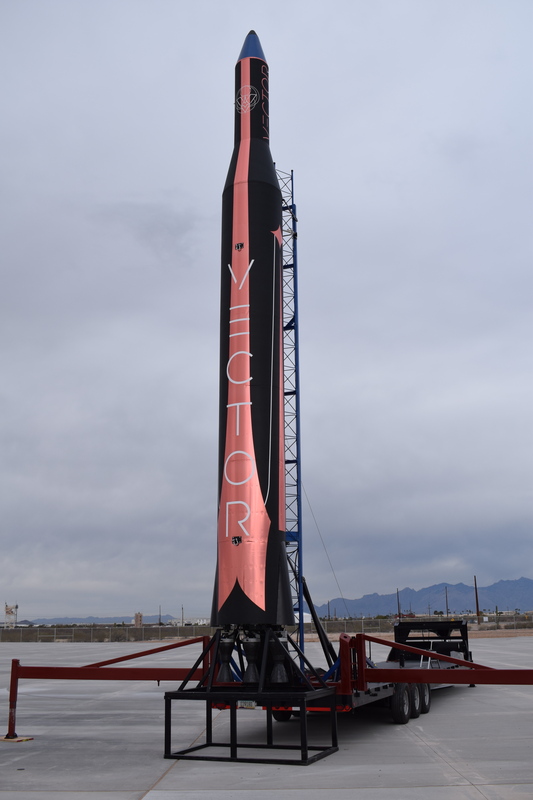 Vector Space Systems was founded in 2016 with headquarters in Tucson, Arizona and an engineering facility in Huntington Beach, California. The company’s CEO is Jim Cantrell who was part of SpaceX when the company started out in 2002. He contacted John Garvey of Garvey Spacecraft Corporation in late 2015 to discuss whether Garvey was willing to partner up with Vector to use rocket designs developed by Garvey since the 1990s as a foundation for Vector’s orbital-class vehicle. Garvey Space, a small aerospace research and development company, had the overall goal of developing a commercially-viable nanosat launch vehicle (NLV). After becoming a full-time enterprise in 2000, Garvey advanced NLV system to a high Technology Readiness Level by completing systems design, ground-based testing and demonstration flight tests of scaled vehicles. Vector absorbed Garvey in mid 2016 and the company received $1 million in seed funding. In addition to NLV launch services, Vector’s portfolio also includes software-defined mini-satellites produced for various applications. The first customer to sign with Vector was ICEYE based in Iceland , booking 21 launches for the company’s miniature Synthetic Aperture Radar satellites capable of all-weather, 24/7 imaging for various applications. York Space Systems signed a $60 million launch deal with Vector in 2016 for the launch of six satellites on the Vector-H starting in 2019. 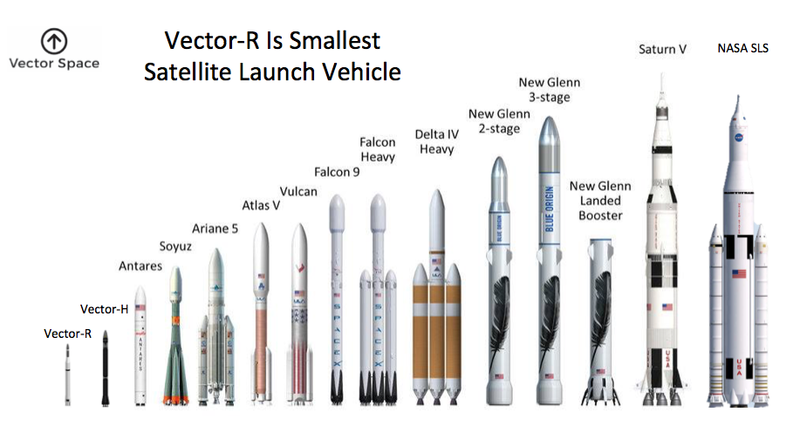 Vector Space joins an increasingly crowded market of Small and Nano-Satellite Launch Vehicles with three different vehicles expected to come on line in 2017/18: Vector-R (50 Kilograms to Low Earth Orbit); RocketLab’s Electron (225kg to LEO) and VirginOrbit’s LauncherOne (300kg to LEO). There are a number of other such vehicles in development ranging from a Japanese CubeSat Launcher with a LEO capability of 3kg to vehicles capable of placing upwards of 300kg into orbit. Vector and other Microsatellite Launch Service providers cite their biggest selling point as creating an independent launch option for small satellite operators. To date, companies wishing to place small satellites into orbit typically had to book a secondary payload slot or fly on a rideshare mission. In such missions, SmallSat operators typically do not have much of an authority over the launch scheduling as well as the target orbit. Microsatellite launchers will allow operators to set their own schedule and deliver their satellites to an optimized orbit at the same cost of a secondary payload flight. Vector is pursuing two lines of business – microsatellite launch services with the Vector rocket family and cost-effective software-defined satellites produced under the Galactic Sky Program. The Vector rocket family employs advanced technology such as composite structures, advanced hydrocarbon fuels and mobile launch capability. The two Vector vehicles share a large amount of commonality with Vector-R expected to become the workhorse of the family with up to 100 annual launches once reaching its fully operational stage and Vector-H handling up to 25 launches that require higher performance. Vector’s focus for 2017 will be on performing a sub-orbital test campaign with a Block 0 non-composite prototype of Vector-R capable of flying low-altitude demonstration missions prior to pushing into tests of flight-like vehicles. Initial testing will be completed at Spaceport Camden, Georgia and Vector expects orbital missions to begin in 2018. The Vector launch vehicle family finds its roots in the NLV-20 Nano Launch Vehicle under development by Garvey for a number of years prior to Vector’s formation. Cornerstones of the Vector design are the use of composite materials for dry mass reduction, robust pressure-fed engines and a patented autogenous pressurization system. 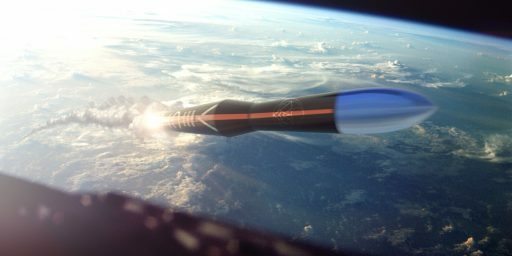 Vector-R is designed for first stage reuse enabling a flight rate of two vehicles per week once the rocket reaches its fully operational stage. 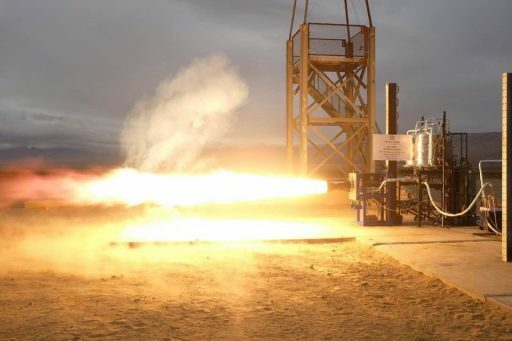 Garvey’s NLV-20 was conceptualized as a two-stage rocket with three engines on the first stage and a single-engine upper stage, both using Liquid Oxygen and Advanced Propylene as propellants. The 11.4-meter tall vehicle was expected to be capable of putting 20 Kilograms into a 450-Kilometer Sun Synchronous Orbit. 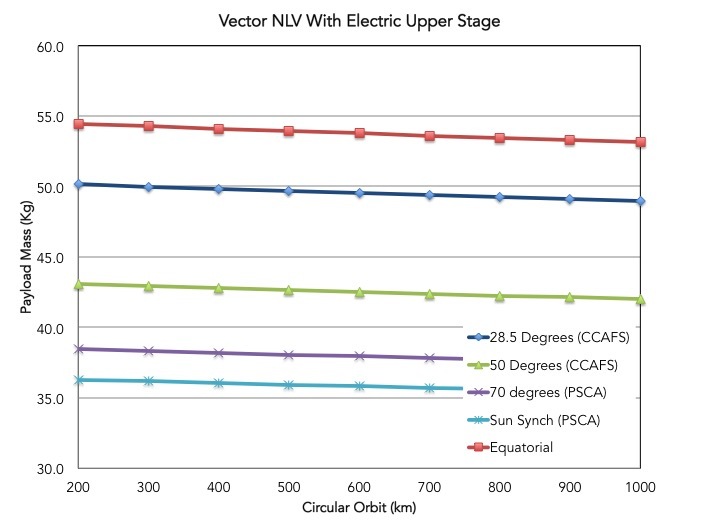 The Vector-R is a larger version of the NLV-20 with improved pressurization systems and a larger second stage for more orbital insertion capability. Vector-R stands 12 meters tall, has a base diameter of 1.2 meters and a launch mass between five and six metric tons (Vector documentation shows both numbers). An optional Micro Upper Stage (MUS) or Electric Upper Stage (EUS) can increase the rocket’s injection capability into higher-energy orbits. 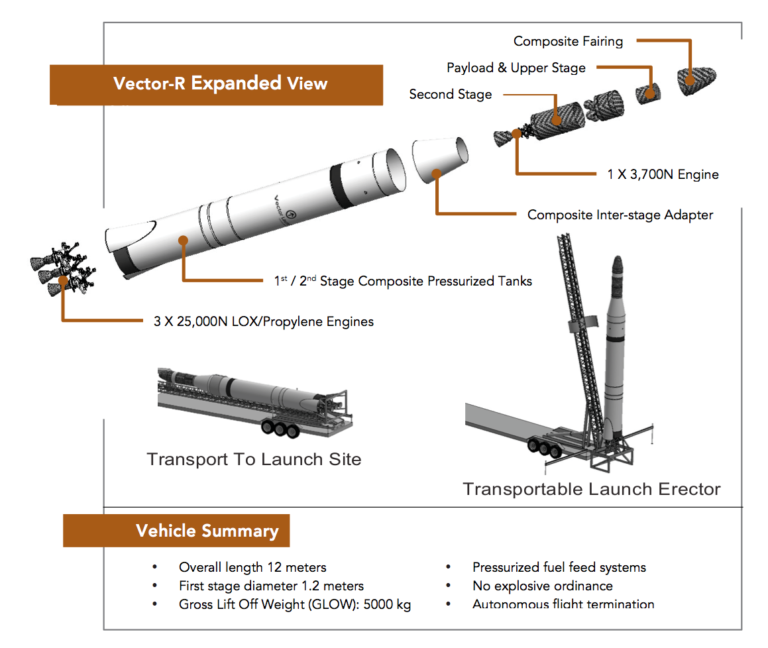 Vector is designed for operation from a Mobile Launch System with minimal support required from spaceport infrastructure, allowing the vehicle to operate from a variety of launch sites. 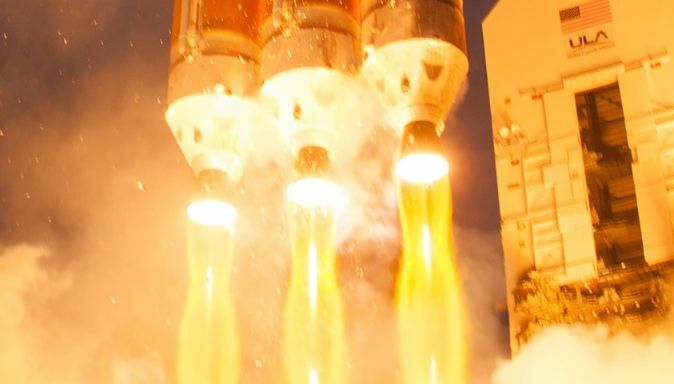 Initially, Vector will launch from Cape Canaveral Air Force Station (CCAFS) and the Pacific Spaceport Complex Alaska (PSCA). Plans exist to expand Vector operations to the Wallops Flight Facility, launches from an ocean-going vessel and an equatorial launch site to support efficient launches into extremely low-inclination orbits. 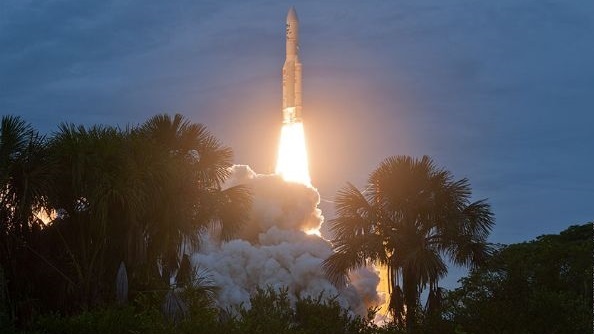 From CCAFS, Vector can reach orbital inclinations of 28.5 to 55 degrees while PSCA will handle launches between 60 and 102 degrees, covering all typical polar and Sun Synchronous inclinations. 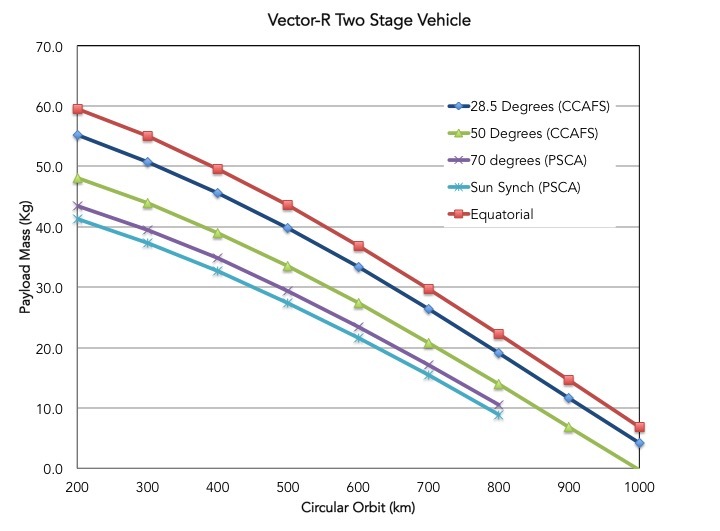 Vector-R, in its two-stage configuration, can lift up to 50 Kilograms into a 200-Kilometer Low Earth Orbit and 30kg into a 450km Sun Synchronous Orbit. Outfitted with the optional EUS, Vector can lift 45kg into an orbit of 800 Kilometers. The vehicle is primarily designed for the launch of microsatellites in a single-payload configuration as well as CubeSats launching as cluster missions. 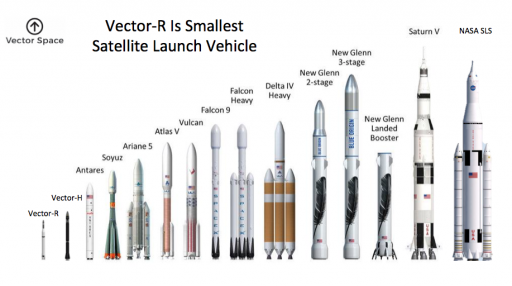 According to Vector Space, the launcher family will also be suitable for nano-scale interplanetary missions. 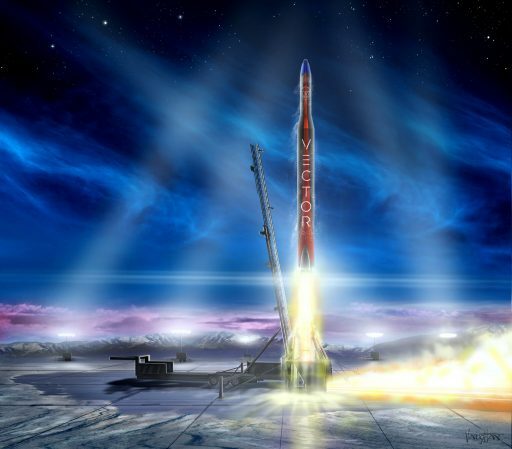 Vector-R’s base launch price is $1.5 million not including any mission customization with a mission schedule dictated by the launch services provider. Premium services such as setting your own launch schedule including missions on short notice will add up to $1 million to Vector’s price tag. The Electric Upper Stage can also add up to $1 million to the price depending on which configuration is chosen. Vector-R primarily relies on composite structures on both of its stages including the tanks themselves and the load-carrying structure. Composite materials are extreme attractive for space launch vehicles as they possess the strength needed to deal with the loads experienced during ascent while being much lighter than the conventional metal alloys used in the first six decades of orbital space travel. According to Vector Space, the use of carbon fiber materials led to a 7x reduction in parts count on the first stage of the vehicle and also gives it the durability for many mission cycles per the company’s reusability aspirations. The Vector-R first stage stands approximately 8.2 meters tall (without interstage) and has a tank diameter of 1.1 meters. It is a stretched version of the NLV-20 first stage with further modification to its structure and pressurization system. Based on the known burn time of 143 seconds and Garvey’s baseline engine parameters, the first stage consumes around 4.3 metric tons of propellant during its burn. Its dry mass is 500 Kilograms or slightly more based on Garvey’s inert mass fraction target for the original vehicle design. Three engines in a linear arrangement power the first stage, each generating 25 Kilonwetons of thrust, giving Vector-R a total thrust of 7,650 Kilogram-force. The engines employ a simple pressure-fed cycle and ablative cooling, eliminating complex turbomachinery and regenerative cooling cycles that are known failure points of rocket engines. Pressure-fed engines use the pressurization of the propellant tanks to force propellants through control valves and into the combustion chamber. To maintain adequate flow to the engine, the tank pressure must exceed the combustion chamber pressure, placing an upper limit on the efficiency of pressure-fed launch systems as an increasing engine pressure would require higher tank pressure which in turn would lead to thicker tank walls and a heavier vehicle. Vector-R uses a combination of Liquid Oxygen as oxidizer and Advanced Propylene as fuel, the first time this propellant mixture is used on an orbital launch vehicle. Propylene (Propene, C3H6) is an attractive alternative hydrocarbon fuel given its non-toxic characteristics, low cost, and simple long-term storage. Additionally, propylene can be densified very easily to increase vehicle mass fraction performance (decreasing the required tank volume by using a more dense propellant, thus reducing vehicle dry mass). Propylene has a boiling point of -47.6°C and can be stored as a liquid under pressure. Vector employs a “proprietary densified Liquid Propylene (LPROP)” for its rockets which is understood to be sub-cooled propylene. Theoretically, the LOX/LPROP combination can yield a vacuum impulse of 347 seconds, assuming realistic combustion and nozzle efficiencies, placing the propellant combination on-par with the highest-performance LOX/RP-1 engines. 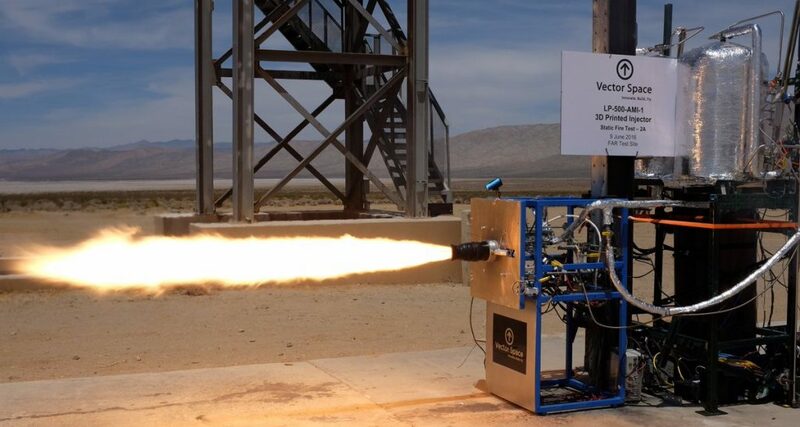 According to Vector Space, the company’s first stage engine can achieve a vacuum impulse in the high 200s ballpark. The baseline engine design parameters provided by Garvey (2008) specify a sea level thrust of 20 Kilonewtons, rising to 29.6kN in vacuum conditions with corresponding specific impulses of 212s and 314s. Engine ignition is accomplished using a solid-fuel port mounted on the side of the chamber that is ignited several seconds prior to engine start and a thermocouple provides positive feedback of ignition before the propellant valves are opened to initiate the combustion process. According to a Garvey report issued in 2008, the engine is capable of operating at thrust levels of 11 kN to 22.6 kN as shown in a ground-based test campaign that operated the engine at chamber pressures of 10 to 20 bar. Work by Garvey indicated an oxidizer-to-fuel ratio of 2.27 would be optimal for this particular engine, on the fuel-rich side of the stoichiometric O2/C3H6 ratio of 3.4. Vector Space may choose a slightly higher mixture of 2.4-2.6 based on information seen so far. 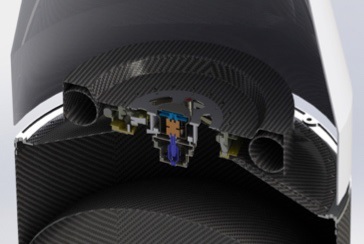 The engines use a carbon/silicon carbide material to fulfill the long-term ablative cooling function required for the operation of the engine over several mission cycles. Fuel film coating of the combustion chamber is accomplished through the design of the engine injector to further reduce the inner wall temperature at the nozzle throat. The nominal burn time of the first stage is 143 seconds, propelling the launch vehicle to an altitude near 100 Kilometers and a downrange distance of 96 Kilometers. Separation from the second stage is completed without pyrotechnics two seconds after cutoff and the first stage falls back into the dense atmosphere. The first stage will deploy a parachute to slow down and enter a vertical descent to be captured by an Unmanned Aerial Vehicle that will fly the stage back to the launch site for refurbishment and re-use. 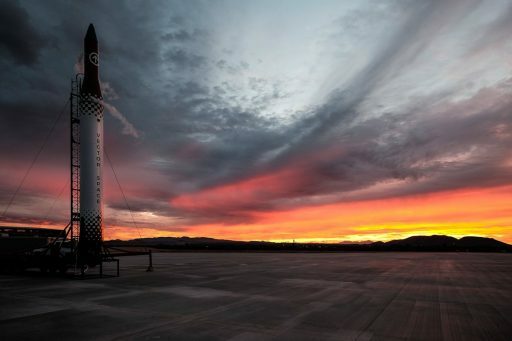 Like the first stage of the Vector-R rocket, the second stage primarily uses carbon fiber composite materials for its tanks and load-bearing structure. The second stage has a reduced diameter of 0.635 meters and a separated length of around 2.8 meters. The propellant tanks have separate bulkheads, creating a small volume for pressurization equipment and avionics. The second carries nearly 500 Kilograms of propellants using the same Liquid Oxygen – Advanced Propylene combination as the first stage. A 3.7-Kilonewton (380 Kilogram-force) engine powers the second stage for a nominal burn time of 433 seconds to push the payload into its target orbit. The stage can support two-burn mission profiles, however, typical ascent missions will achieve the target Low Earth Orbit with a single burn of the second stage, creating a total ascent duration of nine minutes and 38 seconds. Details on Vector’s upper stage engine are sparse. It uses a 3D-printed injector and likely achieves a specific impulse in the 343-347-second range based on development documents from Garvey that discussed the design of a pressure-fed upper stage engine with a flat injector and 16% fuel film cooling. The second stage carries the avionics of the Vector-R rocket including the flight computers and communications system that provides vehicle telemetry to the ground for real-time insight into flight progress. Vector-R uses an Autonomous Flight Termination System which computes the vehicle’s position within its flight corridor based on GPS data processed by redundant, majority-voting systems that will trigger the destruction of the vehicle in the event of flight parameters exceeding pre-set boundaries. The second stage is responsible for either directly inserting payloads into their target orbit or, when a third stage is employed, placing the stack into a staging orbit of 200 to 250 Kilometers from where the Upper Stage takes over. 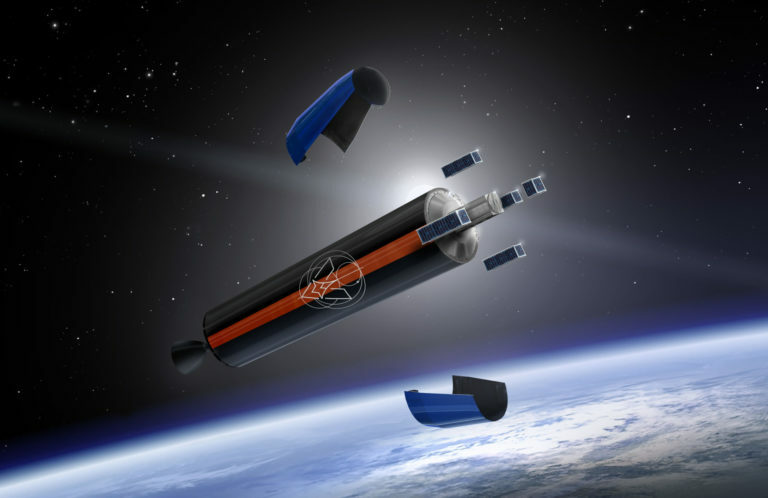 Vector Space will offer a pair of optional third stage designs for the Vector launch vehicle fleet – the Micro Upper Stage (MUS) and the Electric Upper Stage (EUS). The MUS is available in different configurations ranging from 3U to full-stage sizes and delivers a thrust of 20 Newtons over extended propulsive phases to inject payloads into higher-energy orbits. According to Vector Space, MUS can place up to 35 Kilograms into an 800-Kilometer orbit. The innovative EUS utilizes electric propulsion to place up to 45 Kilograms into an 800km orbit with the transition from a ~250km transfer orbit into the injection orbit lasting several months given the low thrust of electric propulsion technology. 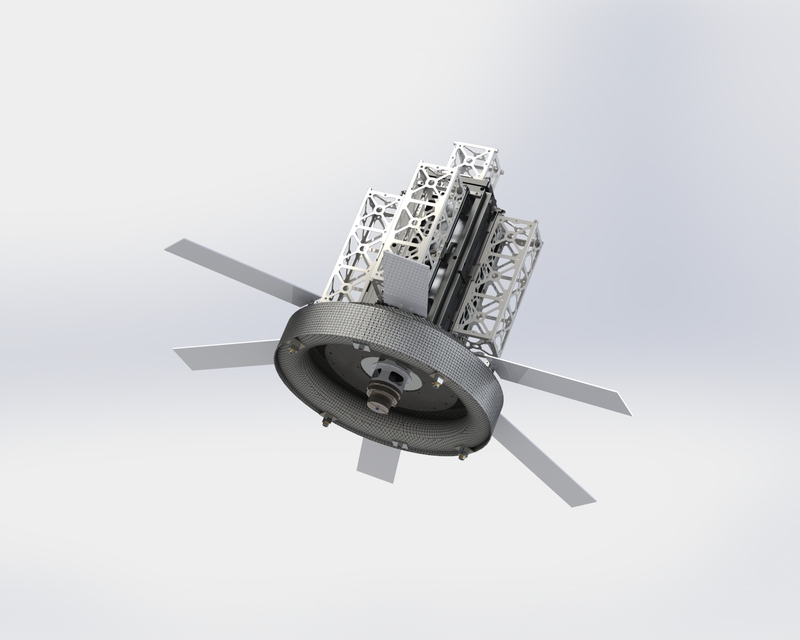 EUS utilizes a micro cathode ion propulsion system and is available in two configurations – one with its own power & attitude control system and one comprising only the propulsion unit and drawing power from the spacecraft which also controls the stack’s attitude. The first configuration type is suitable for multi-payload launches while the second requires direct interaction with the spacecraft that is in a master role and commands the EUS to fire according to its power and attitude requirements. EUS can remain attached to the integrated spacecraft for orbit maintenance maneuvers. The EUS makes use of heritage systems developed for Vector’s satellite division and achieves a specific impulse of 1,800 seconds with thrust settings available from a few micronewtons up to 1 millinewton. EUS comprises a torus-shaped central section featuring the µ-CAT propulsion system and hosts a varying number of solar panels extending radially from the center section to generate power consumed by the propulsion system. 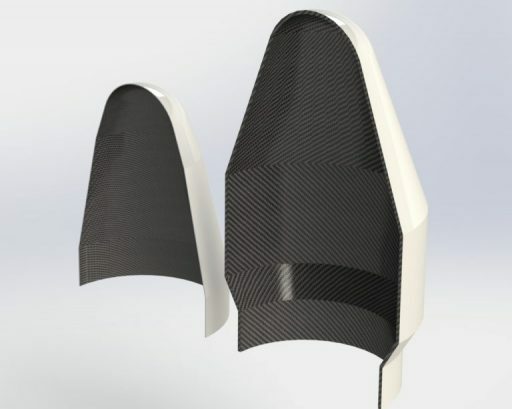 Vector plans to offer two different fairing designs, a standard fairing size and a larger version becoming operational after Vector-R begins flying to cater to larger spacecraft. The standard payload fairing provides a usable payload envelope 39 centimeters in diameter and 53 centimeters in height with another 13cm available at a reduced diameter of 29 centimeters. The standard payload envelope can fit three 12U CubeSats, two 12U and four 3U satellites, or eight 3U satellites, as well as single payloads that are sized accordingly. Vector’s payload interface design eliminates secondary payload structures such as satellite deployment pods that take away precious payload mass. Instead, satellites are mounted directly to the launch adapter with suitable separation systems ranging from 1 to 12 U Light-band separation systems, although pods can be employed at the request of the customer. The standard adapter used for single-payload missions is the 8-inch (20.3cm) Planetary Systems Light-Band Bolt Circle Adapter. Payloads are integrated at Vector’s Tucson, Arizona facility where a 100,000-class clean room is available. Inside the fairing, payloads are maintained in a dry nitrogen environment for transport to the launch site and installation of the assembled fairing on the launch vehicle occurs during the week of launch. Vector allows payloads to fly in an active state with their radio transmission activated; rideshare missions or secondary payload slots typically dictate the satellites to launch in a dormant configuration to avoid interference with the primary payload on the flight. * Estimated Parameters based on graphical analysis & calculations using known engine parameters & burn time, Baseline values taken from Garvey Spacecraft Corp. design proposals.